Small finishing touches can really bring a new bathroom to life. 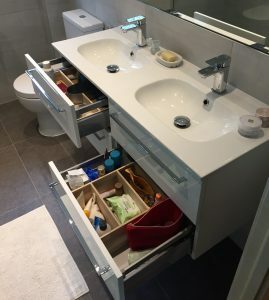 This was the case on an install recently completed by EGBK Installations where some really great design ideas made a big difference on the final appearance of the bathrooms. We would like to share some of our favourite touches with you here! Illuminating the underside of a bath gives a floating effect as you can see in this photo. 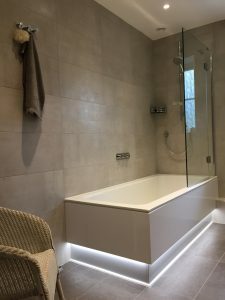 LED strips are lined around the inside of the bath panel and controlled on a separate switch from the main lights, meaning that they can be controlled separately. This lighting was a special request from the customer and we can really see why they have chosen it. Recessing the soap holder into the wall of your bath or shower gives a much tidier look than having a rack or tray for your toiletries. As you can see this toiletry holder is also illuminated via LED strip lights. 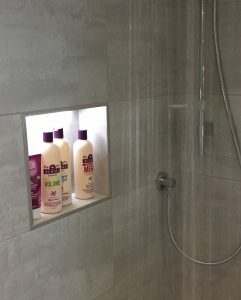 These lights illuminate when the shower is turned on, therefore they are only illuminated when the shower is in use. This saves the need for a switch to turn the strip lights on and off and means they are only in use when needed. Once again strip lights have been used extremely effectively to illuminate these glass storage shelves in the bathroom. A small strip of LEDs is placed at the back of each shelf to shine a blue light through the edges of the glass. 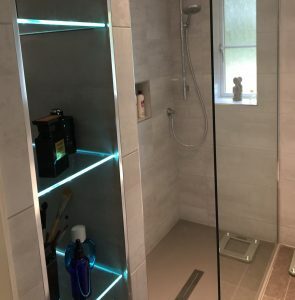 These strips are controlled by the main lighting switch so will illuminate when the main bathroom lights are switched on. Storage is key in a shared bathroom, with so many toiletries and products to store, where do you put them all? These segregated under-sink draws means you have separate areas for all your different products, keeping them neat, tidy and easy to find!